I just visited a conference about the launch of GPLv3. There was a very nice ambience. 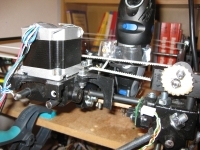 People I talked with were very interested in the possibility of the RepRap, and about it being a project under the GPL. As everyone related to the project has envisioned, the RepRap will become a very versatile machine! Not just because they expected this, but because all of us had different plans with it. I wanted to actually mill PCBs… and this now seems very possible. 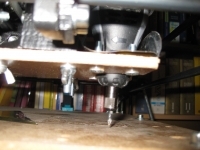 The RepRap’s standard toolhead is for extruding plastic. Nice to have to make many useful things. There are several things it’s good at. It can make things that are not possible with the industrial standard of injection moulding. In terms of shapes it can create a hollow object consisting of one part. It can contain other components if its assembled during build. It could potentially reinforce the plastic with glass fibers, ceramics or a metal frame (to make for a composite material), this makes it stronger than any plastic moulded object could ever be. It could vary in color and still be made in one piece (adding the color pigments CMYK-style) as we extrude it, etc. Using edding markers of various colours this seems likely to be possible. But a lot of testing needs to be done (as always!). In summary, A lot of posibilities for plastics. My first RepRap engraving/milling result! Previous story (AVR-)Dude, Arduino crashes fixed! Note to self (and perhaps others): I now bought a 9909 milling bit from dremel. I guess this would be available in almost any hardware store. 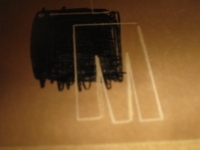 I’m also very interested on doing PCB milling, and I though that maybe the reprap could be modified to this end. According to what I’m reading, and please forgive me and correct me if I’m wrong, but, you started with one of these: http://reprap.org/bin/view/Main/WebHome and modified it to mill PCBs? if yes: I intended to do the exact same thing, how was your experience? Has you been able to create some PCBs with it? Both of these links contains interesting information on *other* machine (RepStrap, I believe). Any information about your experience with this would be great!